The College 2.0 Algorithm is the heart of the College 2.0 Model, articulating the model's unique design through data. The result of years of careful study and design, the algorithm enables a groundbreaking outcomes-based model for funding higher education that has never before been possible. With a complete picture of their graduates' success, institutions can rely on income contributions for a steady, predictable revenue stream deep into the future. 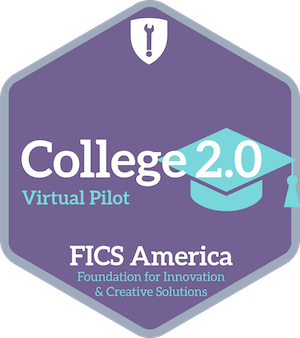 In order to provide the public with a full understanding of the College 2.0 Algorithm's capabilities, FICS America is seeking a diverse selection of institutions to participate in a Virtual Pilot. To participate, institutions share certain data sets with FICS America for analysis in the College 2.0 Algorithm. FICS America uses that data to design a sample version of the College 2.0 Model for that institution and runs it against different scenarios to test its resilience against economic fluctuations. The results are then published and made available to the public. Applicants may need to seek approval from the appropriate institutional authorities. FICS America requests no identifiable student information and publishes only aggregate data after College 2.0 analysis (and agreed upon with the institution prior to use). Complete the form below to request an institutional application for College 2.0 Virtual Pilot.